At just 40mm high, Pearlstone trays are amongst the sleekest on the market and are made of the patented 'Pearlstone Matrix' meaning the range is one of the strongest and lightest available. The trays are up to 30% lighter than conventional stone resin trays - making them safer for handling and fitting. 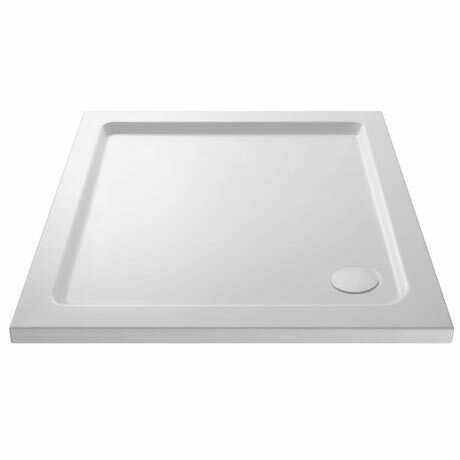 The Pearlstone Trays slimline design means it can be fitted inset into the floor creating a wet room, flush to the floor as standard, or raised above the floor with the Easy Plumb Fitting Kit. All trays are acrylic capped and constructed from a polyurethane resin mixed with filler including volcanic ash - a benefit of this is that the matrix has screw retention so that the feet from the riser kit (sold separately) can be screwed directly into the base of the tray. Q. what is the weight of this product? Hi, the smallest tray weighs approx. 20kg and then weight goes up as tray gets bigger. I hope this helps, please let me know if there is anything else we can do for you. "Perfect for our needs,good quality shower." Best buy for a customer and will be using all the same materials again. Very heavy, but you can tell it is a quality item, that should be long lasting. Very pleased. Brilliant quality for a cheap price. Looks beautiful in my new bathroom.